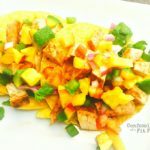 Grilled pork tacos bring together perfect summertime flavors with fresh, homemade avocado peach salsa! Chop and mix the salsa then fire up the grill to have dinner ready in no time! Combine ingredients for salsa together and refrigerate while prepping and cooking your pork. Using a meat pounder, pound pork until the thickness is pretty even. Spray pork chops with olive oil spray, then sprinkle both sides with some salt, pepper, and salt free taco seasoning. Grill pork 4-5 minutes minutes per side or until cooked through. Remove from heat and let it rest for a few minutes. Lightly spray the corn tortillas with olive oil and place on the top rack of the grill for a minute or so, just until warm and pliable. Assemble tacos! I love starting with some Greek yogurt mixed with lime juice, then layering lettuce/cabbage, followed by the the pork and the peach avocado salsa. YUM! !